If you live in the Boston area, here’s an idea for what to do this weekend: The 2010 Bumpkin Island Art Encampment! Consider making a day of it and come out and visit on one of the public visitation days, Saturday, July 31st or Sunday, August 1st. Seven artists groups homesteading on a island off the coast of Boston! Check out this link: www.berwickinstitute.org/bri/bumpkinisland for more details and information about the special Art Encampment boat shuttle that will deliver you directly from Boston to the island and back to the mainland! If you’re thinking of going, reserve a space on the boat now, as it will fill up and the alternatives are painful for they involve changing boats, the direct ferry is the best way to get there and back! I’m involved this year as a project fellow documenting the Encampment. I will make the footage accessible to both participating artists and the public, working with interested collaborators to develop a participatory documentary on the project. If you visit this weekend, please consider making media (sketching and/or taking photos and/or recording audio and/or shooting video and/or writing) of your experience and sharing it with me. Contact me if you would like more details about my project. 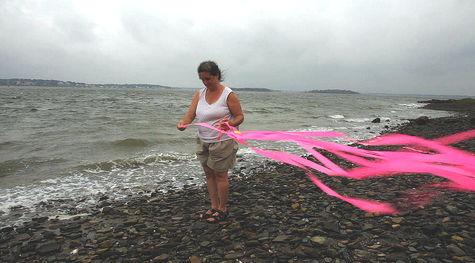 Photo: Kate Dodd, “Ebb and Flow, ” 2009 Bumpkin Island Art Encampment, photo by Patrick Johnson.